166 pages | 13 B/W Illus. 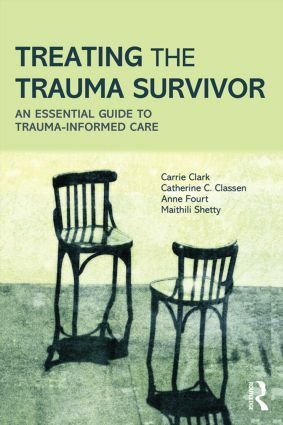 Treating the Trauma Survivor is a practical guide to assist mental health, health care, and social service providers in providing trauma-informed care. This resource provides essential information in order to understand the impacts of trauma by summarizing key literature in an easily accessible and user-friendly format. Providers will be able to identify common pitfalls and avoid re- traumatizing survivors during interactions. Based on the authors’ extensive experience and interactions with trauma survivors, the book provides a trauma-informed framework and offers practical tools to enhance collaboration with survivors and promote a safer helping environment. Mental health providers in health care, community, and addictions settings as well as health care providers and community workers will find the framework and the practical suggestions in this book informative and useful. Carrie Clark attained her doctorate from the University of Denver. She completed a postdoctoral fellowship in the Trauma Therapy Program at Women’s College Hospital. She is on staff as a clinical psychologist in the Trauma Therapy Program. She specializes in the area of trauma therapy. Catherine C. Classen is a clinical psychologist with expertise in the treatment of psychological trauma. She is an associate professor in the Department of Psychiatry at the University of Toronto, Senior Scientist and Director of the Women’s Mental Health Research Program at Women’s College Research Institute, and Academic leader of the Trauma Therapy Program at Women’s College Hospital. She is a past president of the International Society for the Study of Trauma and Dissociation, sits on the editorial board of several trauma journals, and has numerous publications in the area of psychological trauma. Anne Fourt is an occupational therapist and team coordinator for the Trauma Therapy Program and Women Recovering from Abuse Program at Women's College Hospital. She is an assistant professor in the Occupational Science and Occupational Therapy Department at the University of Toronto and has a cross appointment in the Department of Psychiatry. Maithili Shetty is a psychiatrist and clinical faculty at the University of British Columbia. She received her medical degree at the University of Western Ontario and completed her residency in psychiatry at the University of Toronto. Dr. Shetty is the Director of Medical Education, Medical Director of the Psychiatric Assessment and Stabilization Unit and Inpatient Lead for the Department of Psychiatry at St. Paul’s Hospital in Vancouver, British Columbia.